I awake in the dark, my tent rattled. I listen, I hear the wind whooshing through the trees as it moves away. Far off, up on the peaks, the wind whooshes again, coming nearer and nearer. Like a specter, it moves through my tent rattling the edges , and then it moves away again. Ghost riders in the sky. I drift off to sleep again, no ghosts will be bothering me. The air is clean and cool, I lay wrapped in goose down. My face feels to cool breeze as it blows through my tent. The rest of me is cozy and warm. It's a little lighter than it was, the sun is coming back around to warm this side of the planet. I close my eyes and drift off. I awaken to even more light. It's time to get up, I have a real breakfast today. Granola, instant breakfast, dehydrated fruit, and a Starbucks via caffe mocha. Today's goal is a mythical campsite overlooking Lake Tahoe. A place where I might view fireworks from afar. A place I'm not sure even exists. The trail leads me from my camp down the hill where the breeze is less. Fontanillis Lake is lower yet. A young family is there. The little girls are bundled in clothes like they are going to play in a snow park. Dad’s hammock swings from a few trees. What a lovely scene. Then suddenly I'm in a cloud of swarming mosquitoes. I have never seen so many at the same place at the same time. Millions? Gazillions? They are not biting me yet, Time to keep moving. The problem is that the long forest of desolation is before me. I walk at least to the stream crossing. I refill with a few liters of water after applying a fresh coat of insect repellent. It's amazing to me how well insect repellent works. I use Sawyers micro-encapsulated blah blah blah. The active ingredient is DEET. It works amazingly well. I suddenly become invisible to the little suckers. I am surprised how many Thru-hikers eschew using insect repellent and would rather live in the semi darkness of a bug headnet. Hey, Hike Your Own Hike man, whatever. I replenish my water and set out into the forest. This is the part of Desolation Wilderness that very few people visit. People like lakes, streams, water features. This forest has none of that. It has solitude. Miles and miles of trees. Lots of mysterious glens and glades. A sudden Meadow surrounded by a ring of trees. Always the feeling that someone or something is watching me. I turn quickly, but see no one. No one on the trail. No one in the bushes. The sun's rays don't penetrate as far here. Too many branches. There is a buzzing in the air. The place is thriving and from my view this is a healthy forest. A happy forest, it's a forest happiest when left alone. It doesn't like visitors. The elves that live here shun guests and secretly watch me from behind the trees. If I stop, hordes of their trained mosquitoes descend upon me from every direction. DEET or no DEET I am the subject of intense suspicion and obvious hostility. “Keep moving, there’s nothing to see here,” is the message I hear in their insistent whining. I get the message, and keep moving. The moment I start moving the mosquitoes go back to doing whatever it is they do when there are no humans to torment. Barker Pass has a pit toilet. Worth walking to even if you're not hiking the PCT. The only one for miles around. There’s often a line of people waiting to use it. I take my place in line, it's an informal line, you don't physically have to stand in it. You just have to be watching for the occupier to exit and walk quickly to the door. If you're the first one there, congratulations, you're at the front of the line. A clear view of the door is key. I see a Thru-hiker squatting on a picnic table. Not literally squatting, squatting as in being someplace that is really not your place to be. Thru-hikers don't ‘picnic’. Baskets are too heavy and inconvenient. Much easier to stuff your food in a bag. Smash it in there next to your clothes and sleeping bag. I join the Thru-hiker, his name is Miles, and help him justify being there by pulling out my food and pretending to ‘picnic.’ Really though, I'm just eating food from a bag. The Barker Pass trailhead is on a dusty dirt road. Downwind of the road, we are covered in a another layer of fine road dust every time a holiday reveler passes in his four.by four. Like ants on a cookie crumb. Thru-hikers emerge from the forest and join our picnic. Soon it's standing room only as we eat voraciously from our various bags. A few stoves appear and soon the smell of boiling top ramen noodles fills the air. We discuss fireworks and mythic campsites. Soon, alas too soon, it's time for me to move on. There is no water at Barker Pass. The next water is right around the corner, or so it seems to my memory. In reality it's really like two miles of corners and climbing up and down before I reach the stream which seems so close in my head. I get enough water to camp anywhere I choose. ‘Dry camp’ it's called, when you camp without a local water source. In case the mythic campsite is without a local water source. It's early afternoon and I have completed all the miles needed to ensure I can make it to Donner Pass tomorrow. I walk on full alert, up and up the switchbacks until I gain the ridge. Views of Lake Tahoe to the east are a dime a dozen. The wind is more insistent up here. Pretty typical now that I'm walking in it. “Oh yeah, it's windy up here,” I think. A new requirement is added to the mythic campsite, trees or rocks that block the wind. This is ridge walking at it's finest. Views in all directions, no clouds, and the ever present wind reminding me how small I am. Wind makes me want to hurry. I want to hurry and get out of it. I think about trying to setup my tent in the wind. I think about the thunderous flapping of the fabric all night long. I think about stuff flying from my hand and blowing out to the lake to sink forever into its cobalt blue depths. I realize that the mythic campsite is just a myth. I have another six and a half miles before a decent campsite and I was thinking maybe two. This is going to push my past my anxiety point yet again. I will miss my four pm appointment with my tent again. I hike on. Across the ridges exposed to the wind and sun. Alone again. It continues to surprise me how alone I am while hiking regardless of how many thru-hikers I was just with at the last place I stopped. The wind howls and gusts. The sun sinks lower in the west. This reminds me of my childhood in San Francisco, afternoon winds that blew like they'd never stop. A hard cold biting wind. This is not quite as cold, but it's definitely not something I want to camp in. 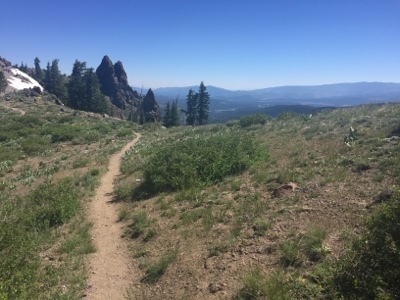 The trail is rocky and narrow as I traverse across these steep slopes covered in sage, and wildflowers, mostly Mule Ears with their soft furry leaves and their bright yellow blossoms waving wildly in the breeze. How harsh life would be to be rooted to the ground here. Blazing sun in the summer, blankets of frozen snow in the winter, and the wind, always the wind. Man made structures appear. Chairlifts communications towers, snow fences. All blasted by the wind. I am buffeted in different directions as I turn and pass through some giant volcanic boulders with rocks embedded in them. These peaks along this ridge are all volcanoes, I think. I try to imagine this entire ridge billowing smoke and lava as the wind carries the dense acrid plume eastward. I wonder if the lake was here then? No mule ears or sage, just burning hot brimstone. Down into the valley, switchbacks down, left and right. I take my time, protecting my right knee. It really isn't bothering me all that much. It just threatens to every now and again. Especially when I'm going downhill. Five Lakes are around here somewhere. I see no lakes only a sign saying so and an arrow pointing in a direction I'm not going. There is a stream though. I get more water. There are campsites too, not mythic ones, no views, more importantly, no wind. Most sites are filled. Day hikers, section hikers, and Thru-hikers all blended together in a melting pot. I camp next to a guy whose hiking style is different than mine. I used to hike like that. I never saw his pack as he was there when I arrived, but it must be immense. I remember how proud and confident I felt when I purchased my giant backpack that would hold everything I could possibly need and then some. The pack was seven and a half pounds all by itself. I could carry as much as I wanted to. Fifty, sixty, even seventy pounds. I remember balancing my pack on one knee, then flipping it around onto my back. My legs would wobble under the added weight. In those days, hiking eight miles was extremely far and exhausting. But I had everything I thought I wanted when I arrived. They say you carry your fears in your pack. Perhaps so, but I don't remember being fearful. I don't remember being ignorant. All I know is that when I started lightening my load it became more enjoyable to hike. I used to hike to reach a place to camp. Now I camp so that hike again tomorrow. I have zero interest in adding more weight to my pack so I can have more of what I have at home when I'm camping. Camping now is only a means to an end. My hike is about the journey, not the destination. Completely opposite of how I used to be. I shouldn't laugh. There really are bears here. I haven't seen one in eleven hundred miles. I am so glad to not be carrying a bear canister. I have some government certified odor proof bags that I keep my food in. I stick them down by my feet in my tent. So much lighter. It's late and the shadows are deepening. I'm the last one still up. That's a switch. Into my tent and blissful sleep. It's blacker than dark. I pitched my tent under some dense trees, there is no moon, star light doesn't penetrate to me. I am jolted awake. From a dead dreamy sleep I am suddenly back in reality. What was that? Something brushed by my tent. It sounded like a tree branch. Or something furry. All is silent, I wait holding my breath to listen for the faintest sound. Silence. I know what I heard. I start racking my brain, where are all my food wrappers? Are there any in my pockets? Are there any in a stuff sack that I forgot to put away? What about my snickers bar? Peanut Butter? I can't think of anything that is not in my odor proof bags. Did I seal them properly? It's dark, it's quiet. I can't even hear the other hikers, only the sound of the water flowing in the distance. Wait what's that? A sound. A churring. It stopped. Something's out there. It brushed by my tent. Is it coming back? I wait. Silence. Is it still there? I drift off. Suddenly I am jolted awake something about the size of a raccoon hopped across my legs towards my food bags. If it hopped across my legs that means it's in my tent. I kick up savagely. My legs hit nothing but the top of my tent. I kick to the sides, hitting nothing but net. The last thing I want to do is fight a raccoon in a small tent. Perhaps it exited the same way it got in? I dig around in my sack of tools for my headlamp. I switch it on to red light. A bright beam of red light pierces the gloom. I shine it towards my feet, my food bags. I search. Nothing. Any holes in my tent? Nothing. My tent is all drooping though. Was it outside my tent? Or maybe I dreamed it? Either way the shot of adrenaline it gave me has my heart racing. Whether real or phantom it doesn't bother me again, eventually I drift off to sleep. Wussup Sir, I commenting because my teacher told me too. BUt I think that what you're doing right now like hiking the pct is a cool thing to do.I believe that you can make it. Your doing good keep it up. O my gosh Scott! That post had me on the edge! I was thinking there was this massive and ferocious rat in your tent. hahaha. Hope you are encountering some amazing things on your journey!